This past Saturday we packed up our grills and headed over to Drexel Hill, PA to cook for two awesome customers, Harry and Tina. We served up nine tasting courses, each recipe selected because of its taste but, more importantly, its simplicity. These are easy to prepare dishes that our customers can fit into their busy lifestyles. After all, with this type of quality meat and organic vegetable products, you don’t need to be a gourmet chef to prepare an incredible meal! The crowd was very impressed and I’m sure we made a few new customers! We would love to come to your home and treat you and your friends to some delicious eats too! 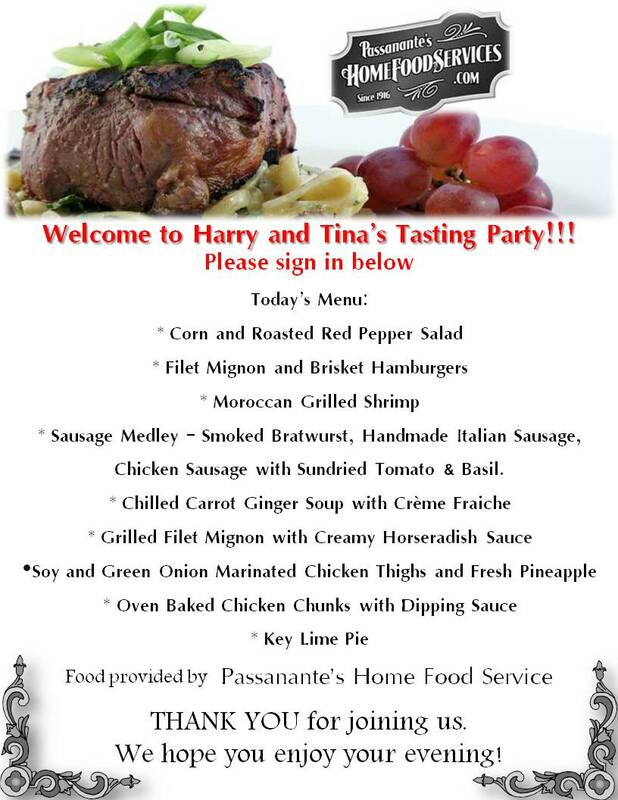 Give us a call at 1-800-772-7786 to inquire about Passanante’s Home Food Service Tasting Parties or chat us up on our Facebook Page! This entry was posted in Tasting Party and tagged Food Delivery Service, Organic Food Delivery, Passanante's Home Food Service, Quality Meat, Tasting Party by Passanante's Home Food Service. Bookmark the permalink.